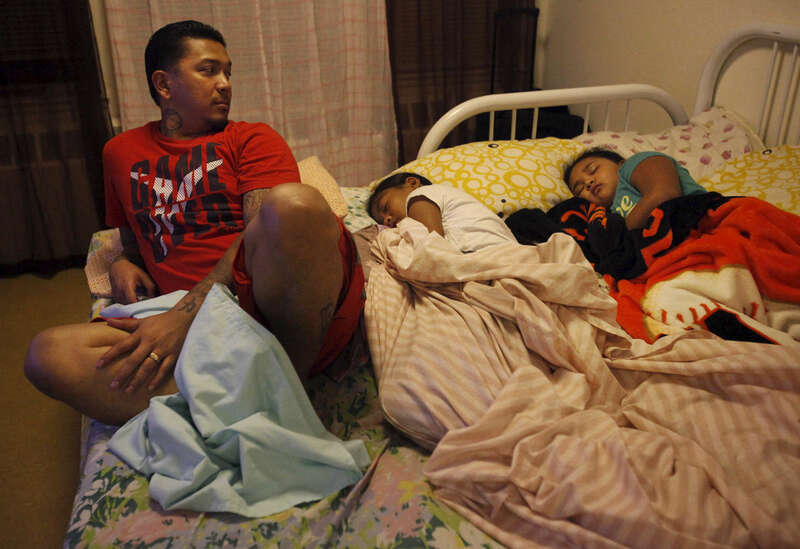 Red Rodrigo glances over at his two daughters, Brennelyn, 8, right, and Bryanna, 11, as they sleep in the bed he and his wife (their mother) sleep on in the living room in their transitional apartment Oct. 21, 2014 in San Francisco, Calif. Because the children grew up sleeping together, sometimes all five in one bed, the two youngest still like sleeping with their parents. The Rodrigo family has been living in transitional housing for almost a year after staying with a large number of family members in a very small apartment. The family hasn\'t really had a place of their own and have enjoyed having the apartment to themselves but their time allotted in the place is almost up.